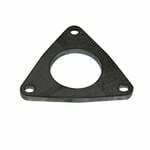 Custom exhaust flange for GM Ecotec engines. This flange is 3/8" thick laser cut cold rolled steel. Q: I just ordered one of these via your Ebay store - does it come with the gasket? If not, what is the part number for the gasket? Hi, No it does not come with the gasket. GM 90537740. Thank you.